The world’s largest particle accelerator is roaring along at an unprecedented pace, delivering torrents of data to its physicist handlers. But the hundreds of millions of collisions happening inside the machine every second are now growing into a thick fog that, paradoxically, threatens to obscure a fabled quarry: the Higgs boson. The problem is known as pile-up, and it promises to be one of the greatest challenges this year for scientists working on the Large Hadron Collider (LHC) at CERN, Europe’s main high-energy physics laboratory near Geneva, Switzerland. Huge amounts of computing power, cunning software and technical tricks are helping scientists to stay ahead of the problem. But researchers may still need to scale back the collisions to find the long-sought Higgs, the manifestation of a field that is believed to confer mass on other particles. If it exists, the Higgs will appear fleetingly inside the machine before decaying into lighter particles. Last year, the two biggest detectors at the LHC saw hints of a Higgs with a mass of about 125 gigaelectronvolts (energy and mass are interchangeable in particle physics). This year, researchers want to collect more data to see whether that signal grows into a certainty, or withers back to nothing. To gather these data, researchers are pushing the collider in two ways: by accelerating the particles to ever-greater energies and by increasing the number of collisions. Higher energies allow heavier particles to pop into being, but it is the number of collisions that will determine whether physicists have enough data to declare a discovery. In the weeks ahead, scientists will pack more protons inside the machine and focus the particles as tightly as possible onto the collision points at the centre of the LHC’s two biggest detectors. 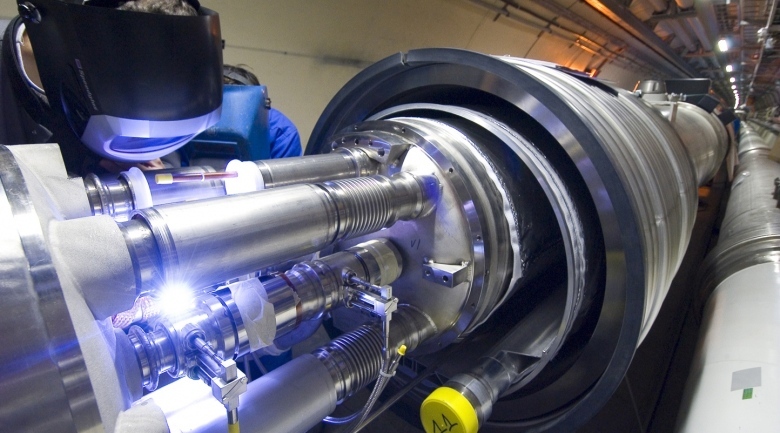 Already, “we’ve done humongously better than we thought we could”, says Mike Lamont, the head of accelerator operations at CERN. Every time two tightly packed bunches of protons cross, they generate not one collision, but on average 27, Lamont says. But within a few weeks, that number is expected to rise into the mid-30s, peaking at around 40 collisions per crossing. The two main detectors at the LHC were designed to handle only around two dozen collisions at once. But they have managed to cope so far. Each detector is made up of layers of smaller detectors that record the tracks of debris coming from their centre. When a collision occurs, computers above the machine decide whether the data are interesting and, if so, reconstruct the collision from the tracks. But when dozens of collisions occur at once, the computers must disentangle them.